One of the things I love most about making pancakes, especially if you're using a cast iron pan (I use Lodge), is how it connects you to generations past. Maybe it's just because waking up to the smell of hotcakes, as my Grandma called them, is a very vivid memory for me growing up. But there's something that feels so good to me doing any form of activity that connects you to the past. Making pancakes on a cast iron pan is one of those activities. It automatically makes me think of early American settlers, cooking breakfast over a fire. Give these apple cinnamon oat pancakes a go next time you want to treat yourself and let me know your thoughts on how you liked them in the comments section below! Combine wet ingredients with dry ingredients and fold together until just combined (don't worry about clumps). Heat cast iron pan over medium heat. Once hot, add a bit of butter to pan and swirl to fully coat the bottom (you could also use olive oil, coconut oil, etc, but I prefer butter because of the richness it adds - if you're making pancakes, commit all the way, right?). Place a small ladleful of batter in the pan and top with your sliced apple (by placing the apple in the pancake batter this way, you guarantee evenly distributing rather than getting a big clump of apple in one area and none in another) and cook until the first side is golden brown *(How to know when to flip: the bubbles that form during the cooking process is key here. Once you see bubbles forming around the outer edges and starting to form closer to the center, the first side is cooked and it's time to flip). Flip and continue to cook for another 1-2 minutes until second side is golden brown. Reserve pancakes and keep warm in oven. After the 1st batch of pancakes, turn heat down to medium-low (especially if using cast iron because these pans hold heat incredibly well), and repeat until all of the batter has been used. 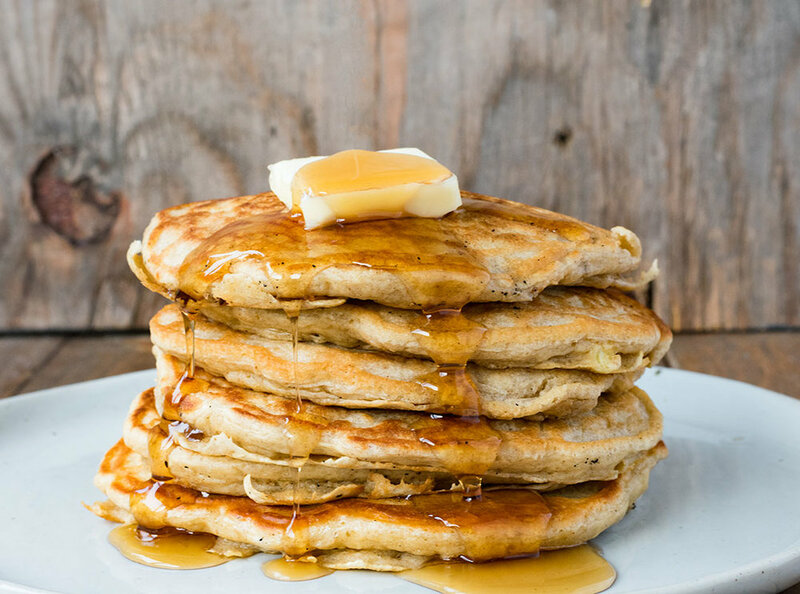 Place a heaping pile of pancakes on your plate and top with a large dollop of room temperature butter and a drizzle of maple syrup.